The past century in the US (and much of the western world) has witnessed the rise of the “Culture of Personality” where Americans increasingly focus on how others perceive them; the extroverted ideals of charisma, salesmanship, and an outgoing nature as celebrated as key traits of leadership, and introverts are… well, encouraged to be more like extroverts. Yet a growing base of research suggests that the extroverted ideal may not be all it’s cracked up to be. While extroverted leaders tend to have bigger salaries than introverts, they don’t necessarily produce better business results, and in fact some suggest today’s increasing focus on extroverted leadership may be leading to an increased amount of risk-taking and reward-seeking behavior (behaviors correlated to extroversion) amongst the highly extroverted executives of some of the biggest companies in the world. In turn, a recent new book entitled “Quiet: The Power of Introverts In A World That Can’t Stop Talking” makes the point that perhaps we should get better at recognizing the value of introverts as well. Notwithstanding the rise of the introverts, within the context of financial planning in particular, it seems that the extrovert ideal still reigns supreme, given the focus of financial planning as a “relationship business” that necessitates extensive interaction and deep bonds between advisors and clients. Yet even here, the reality is that despite misconceptions, introverts are not necessarily shy, and introversion is not necessarily about being antisocial but simply about interacting differently in social environments; in fact, the preference of introversions for more intimate one-on-one settings suggests that introverts might even be especially well suited to form the deep personal connections that support some of the best financial planning relationships! As a strong introvert myself (yes, it’s true!) I find the growing research around introverts to be quite fascinating, and the more I look around the more I find that financial planning may be populated with far more introverts than anyone might have first suspected. But in the end, whether you’re an introvert yourself, or simply trying to figure out how to better work with, manage, or relate to one, Susan Cain’s “Quiet: The Power of Introverts In A World That Can’t Stop Talking” is a fascinating read with a fresh perspective on what introverts can bring to the table, and how introverts can try to function better in what – at least for now – is still a very extrovert-centric environment. In the years since she wrote “Quiet: The Power of Introverts In A World That Can’t Stop Talking” author Susan Cain has been trying to foment what she calls “The Quiet Revolution” – a celebration of everything that introverted people bring to a world that holds out extroversion as an ideal. In fact, as Cain notes in her book, studies have shown that – especially here in the US – people who are talkative and outgoing are rated as smart, better-looking, and more interesting, and even amongst the talkative we rank the fast talkers as more competent and likable than slow ones. This “Extroverted Ideal” is embodied in everything from the common workplace belief that it’s best to work in teams that promote interpersonal interaction and collaboration, to children or quiet workers who are prodded to “come out of their shells” instead of celebrating the creativity for them that comes forth from within. Yet the reality is that it has not always been this way. In fact, the rise of the Extroverted Ideal seems to be a phenomenon of the past century or so in the US; up through the late 19th century, we lived not in a culture of [extroverted] personalities, but a “culture of character” where the ideal was one who was serious, disciplined, and honorable. In other cultures – most notably many Asian cultures – this more introverted orientation is still the ideal. And in fact, Cain notes that despite the popularity of the team-based approach, many of the greatest breakthroughs occur not amidst a group of extroverts working together, but are borne from introverts working alone, from the theory of gravity and the theory of relativity, to a long list of creative works (from writings to paintings), to the creation of the first personal computer prototype by Steve Wozniak who did his work in solitude. Simply put: the Extroverted Ideal may not actually be as ideal as our culture suggests, and we may not be giving enough credit for what introverts bring to the table. While the Extroverted Ideal is expressed widely across our culture and in business, there are perhaps few industries where it is expressed as strongly as in financial planning, where it seems just presumed that everyone will be outgoing and social – how else can one gather clients and work with them, right? How could anyone possibly be in a “relationship business” like financial planning if they’re shy and introverted? Yet as Cain points out, there’s actually a significant difference between being “shy” and “introverted”. As the research is increasingly finding, introverted people may simply be more sensitive to their surroundings; they are more inclined to seek out quieter, more intimate environments to make connections. By contrast, shyness is the actual fear of social disapproval or humiliation. While many introverts are shy, many are not – though their lack of shyness still doesn’t change the fact that they may prefer to be alone to focus, do work, or ‘recharge their batteries’. In fact, arguably the introvert’s preference for seeking out one-to-one relationships may actually make them especially good financial planners, able to connect with and bond with their clients – though for many, the process of “prospecting” and getting clients in the first place may be more challenging. Yet as Cain also notes in the research, when introverted people are especially drawn to a cause or purpose (a “personal project”), they can be quite extroverted for a period of time in pursuit of their goal (though it is still draining to them and will eventually leave them wanting some alone time to recharge). As a result, I actually suspect that we’d be collectively astounded by the sheer number of introverts who have actually been attracted to financial planning, for the depth of personal relationships it creates, and that financial planning can be such a meaningful “personal project” that it allows even the strongly introverted to survive and thrive (even if they feel compelled to hide their “true” nature in the professional world). As it turns out, though, the difference between introverts and extroverts isn’t only relevant for those who might be financial planners, but also those who receive financial planning; as Cain notes, research is beginning to find differences in the financial behaviors of introverts versus extroverts, which has significant implications in their financial planning issues. For instance, extroverts appear to be more “reward-sensitive” in their behaviors; they are more likely to be motivated by rewards, seek out rewards, and pursue them, sometimes going into overdrive in a manner that can create problems – for instance, chasing returns despite the outsized risks and potentially catastrophic results. While reward-sensitivity isn’t unique to extroverts, it does appear to be far more probably amongst them, leading to more extreme risk-taking behaviors while introverts are more likely to acknowledge (and perhaps be dissuaded) by warning signs along the way. In other words, introverts actually appear to be better at making and sticking with plans. Notably, these distinctions between introversion and extroversion amongst clients also has implications for how to interact and communicate with them in the first place. For instance, extroverts may prefer to meet in more open and social settings (e.g., over lunch, over cocktails, etc. ), while introverts will prefer client meetings in a quieter milieu (e.g., isolated in your office or conference room). Extroverts appear to find competitive people more likeable (e.g., play golf with your extroverted clients! ), while introverts prefer those who are more cooperative (e.g., interact them in more friendly contexts). And while extroverts tend to prefer small talk before they dive into deeper issues, introverts tend to prefer deeper conversations and connections first and only come back to small talk later at the end of the conversation or meeting. I will admit that on a personal level, Susan Cain’s “Quiet” resonated strongly with me, as I myself am one of those introverts who has struggled for much of my working career (not to mention in my school days before that) in an “extrovert-ideal” world. Given my active speaking schedule this may be a surprise for many who have seen me present from the podium; but again, as Cain notes, introverts who feel drawn to a higher purpose can cross over and be more extroverted for a period of time while they pursue their personal project (which certainly describes my work in financial planning), and introversion and shyness (or fear of public speaking) are not the same thing (though while I may be comfortable on stage, ultimately like any/all introverts, I need my downtime to re-energize and re-charge). Yet for any introverts out there who have perhaps felt similar challenges, reading “Quiet” will be an uplifting experience in celebrating the power of introverts and value that they can bring to the table. The book does much to tear down the Extroverted Ideal, not necessarily to belittle extroversion, but to celebrate introverts, and recognize that there is a value to both temperaments (in fact, there is even a biological case to be made for why having some introverts and some extroverts may have been better for our joint survival as a species). And for introverts who are still struggling, Cain provides some valuable guidance about how to find your own “personal projects” that can leave you better at ease in today’s extroverted-centric world. For those who may be extroverts themselves, I suspect the book will also give some valuable insight on what the world is like from the introvert’s perspective, and includes a full chapter of tips about how to promote better communication between introverts and extroverts, that can have relevance for everything from advisor-client relationships, to workplace dynamics, to relating better to a spouse. 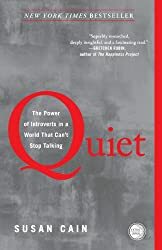 But for those who haven’t read it, I highly recommend “Quiet: The Power of Introverts In A World That Can’t Stop Talking” as one of the best books I’ve read in a long time, both for its personal relevance (as a strong introvert myself!) and implications for all of us as financial planners in how we can succeed (as introverts), and relate to each other, and also our clients. For those who are interested in more, I’ve also included below Susan Cain’s fascinating Ted Talk on these themes and the “Quiet Revolution” as well!